PP Meeting: PP meeting refers to Pre-Production meeting before starting of bulk production. There are various types of garments order, types of styling and buyer requirement. So, PP meeting is very important for garments manufacturing to discuss and do all experiment for production. All department head of apparel industry present in PP meeting so that everyone can be concerned about the requirement of production. 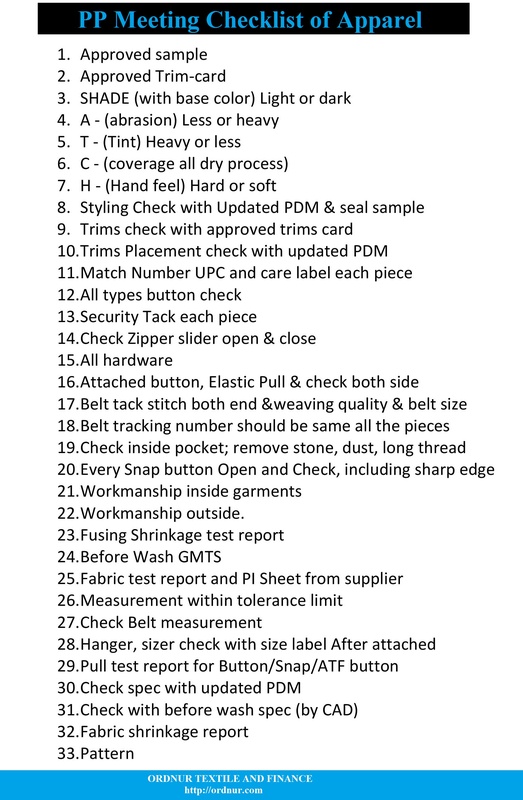 In this article, you will get an overall idea of PP Meeting Checklist in Garments. Earlier we have an article “PP meeting in apparel industry” you can read this for better understanding. Tagged Checklist of PP Meeting, Checklist of Pre Production Meeting, Major Works of PP Meeting, PP Meeting Checklist in Garments, PP Meeting Checklist in Garments pdf, PP Meeting Checklist of Apparel Industry, PP Meeting Checklist of Apparel Industry pdf, pp meeting for garments industry, pp meeting in garments, pre production meeting checklist, Work List of PP Meeting.